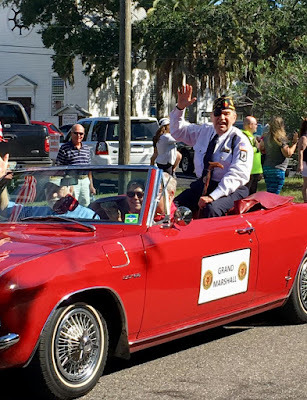 My husband, Bruce Malcolm, American Legion Chaplain of Post 54 and U.S. Marine, was greatly honored to serve as Grand Marshall in our 2018 Veterans Day Parade. I rode with him in the back seat and as we passed spectators, I was touched to witness so many with their hands over their hearts, adults and children both. It is simply wonderful to see the respect our flag and military rightly is receiving these days. Let's keep it up, America! P.S. Thank you to Becki McCartney for taking such a great photo of Bruce!